Sumioshi Sakura (住吉さくら) is one of the 100 best flower spots in Kanagawa. It is also known as the best Cherry Blossom spot in Kanagawa. It is located in Kawasaki. Along 2km long of the Shibukawa River, there are 250 Sakura Trees. From the end of March to the early April, it has the beautiful Cherry blossom. There are no parking or restroom. 1. use Toyoko Line to Motosumiyoshi Station. 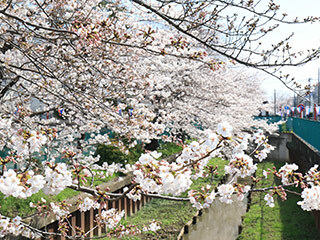 Sumiyoshi Cherry Blossom is a popular Cherry blossom spot in Kanagawa Prefecture. It is one of the 100 best Flower spots of Kanagawa. There are about 250 Sakura Trees along the river. You can see beautiful cherry blossoms with Shinkansen Train.